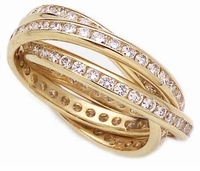 Our Wedding Bands in Gold and Platinum are offered for men and women and consist of many designs of wedding rings for the classic, traditional and modern individuals. For the simple classic look, we have the fantastic Unisex Comfort Fit Series of Wedding Bands for both ladies and men. Then we have our matching sets featuring high quality Ziamond cubic zirconia man made diamond simulants, a series of unique Ziamond wedding bands that beautifully match and compliment both the bride and groom. And finally our Ziamond designer wedding bands with a design flair that allows a woman to express her sense of style and fashion. 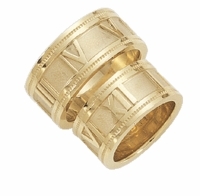 All Ziamond wedding bands are set in 14K solid gold, most are also available in 18K gold or luxurious PLATINUM. For further assistance, please contact us directly at 1-866-942-6663 or visit us via live chat and speak with a live representative.